Everyone has dark moments. Most of us go through dark times that seem to last forever, trapped by circumstances and self – sometimes feeling that there isn’t even a glimmer of hope. Does this happen to Christians? Yes, of course it does. Does it indicate a lack of spiritual maturity or a personal defect? Not normally. We can see from the Bible that it does indicate that the suffering provided a difficult learning or growing experience. In David’s cave at Adullam the discontented and distressed to found REFUGE. In Elijah’s cave his disillusionment found REFRESHMENT. At Lazarus’ cave (tomb) the disbelieving crowd found one RADICALLY ALIVE! Jesus’ cave (suffering, death, tomb) was for the discouraged to find RESURRECTED LIFE! 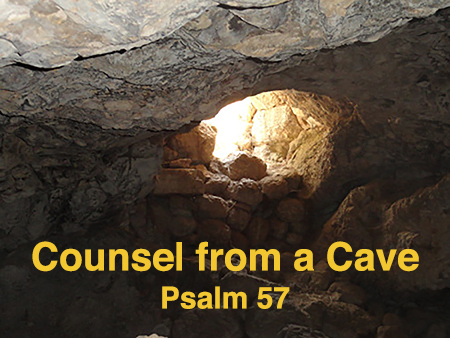 It is widely believed that David wrote Psalm 57 during his time at the cave at Adullam. For some perspective, this cave is just 12 miles southwest of Bethlehem and only 3 miles across the valley of Elah from where David killed Goliath. At this time, Saul was pursuing David to take his life. What a picture of each of us! Satan, like Saul, desires to steal, kill, and destroy. Like David, all who come to Christ can find REFUGE for their soul. David entered in fear and came out FEARLESS! David’s prayer (v. 1-2): He cries out for God’s MERCY. David’s protection (v. 1,3): He takes REFUGE beneath the shadow of God’s wings. WHAT COUNSEL CAN WE GLEAN FROM DAVID’S CAVE? “…who performs all things for ME” (Psalm 57:2). “In the day when I cried out, You answered me, and made me bold with strength in my soul”(Psalm 138:3). 1. DAVID KNEW GOD: 8 times David calls Him by name; 13 times by a PERSONAL PRONOUN. DAVID TRUSTED GOD “For my soul trusts in You…” (v.1). 2. GOD KNEW DAVID See Psalm 139:1-18. 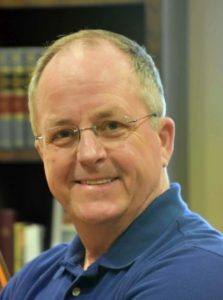 Click to here to listen to more “COUNSEL FROM A CAVE” and Rob’s testimony about his cave experience.